Select your plan and go to the People tab. Enter a name for your team. If your plan is linked to a JIRA project, note that teams are not linked to existing projects so the team name can be unique to Portfolio for JIRA. If you created your plan using one of the pre-defined templates your team schedule will automatically be set to either Scrum (iterative) or Kanban (continuous). Learn more about the templates in the section Creating and editing a new plan. You can set your team's schedule to either scrum - iteration or kanban - continuous. Follow these steps to configure your team's schedule. In your plan, select People. Hover the mouse over team and select Details. Select a schedule type from the dropdown menu. Scrum/ Iteration Creates an iteration based schedule that allows you to define sprint length, start date and sprint length. In addition, you can create custom sprints where you define the start and end dates. When you assign fixed sprints, dynamic sprints are scheduled around them. Kanban/ Continuous Creates a continuous schedule. You can flexibly configure your teams' sprint cycles to accurately plan, and reflect how they accomplish their day-to-day work by setting the teams' iteration settings and adding any fixed length sprints. Hover the mouse over a team's name and select Details. You can configure a team's sprint to start on a certain day of the week. This start date is relative to the start of the plan. Example: If the first release has as start date April 1 (Wednesday), and sprints are configured to start on Mondays; the first sprint will be generated starting from the following Monday, April 6. However, you are using fixed sprints that are set from April 1 to April 15 (a Wednesday), the next auto-generated sprint will start on April 16 (Thursday) in order not to leave a gap in the schedule. 開始 Select a start for the teams' sprints. This is set as a day of the week or with the first release. Iteration length Sets the iteration length for the selected team's sprints. 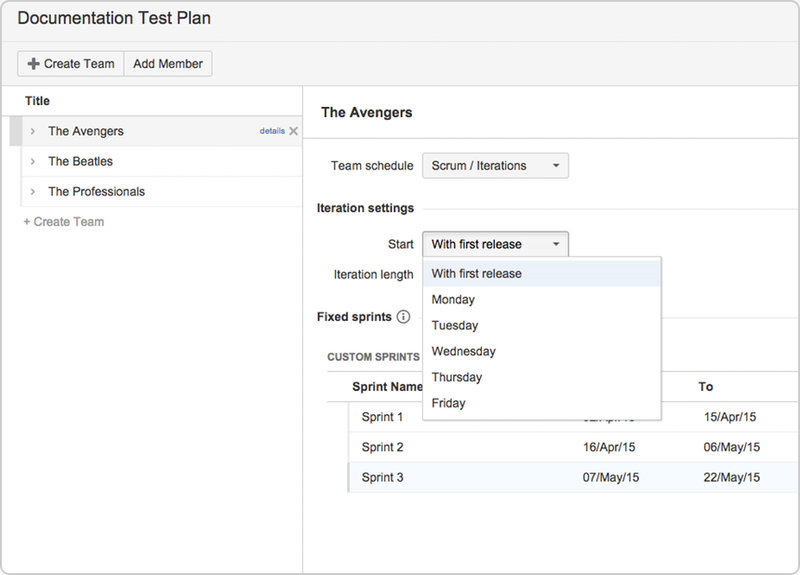 You can set a fixed sprint for a team to create a sprint with a static beginning and end date. When fixed sprints are defined they take precedence over other sprints. This means that these sprints are generated "around" the fixed sprints. If there are gaps between fixed sprints, these gaps are "filled up" as well, given they are large enough. Example: If one sprint is defined from April 1 to April 15, and another from April 30 to May 15, a sprint will be generated in the period between April 16 and April 29. Gaps are filled with sprints as long as they allow for a "reasonably long" sprint, which Portfolio for JIRAdefines as more than half a default sprint length. So for example, if the team works in 2 week sprints, if there is a gap of 7 days between fixed sprints, it will be filled up with a short extra sprint, if there is a gap of only 4 days, the period will remain empty. Select name Name the sprint. Select dates Select the beginning and end date for the sprint. You can also view and set a teams' sprints from using the Sprints column in the backlog. Portfolio for JIRA allows you to add any JIRA users that are available in your JIRA instance. In addition, you can add virtual users to represent work being done that can't or won't be accomplished by a JIRA user. The virtual user acts as a placeholder that allows you to plan for external capacities not found in your JIRA instance, new hires or any undefined member. In the title column, select a team. Click Add Member or select + when hovering over the team. Start typing to find the users you want to add. 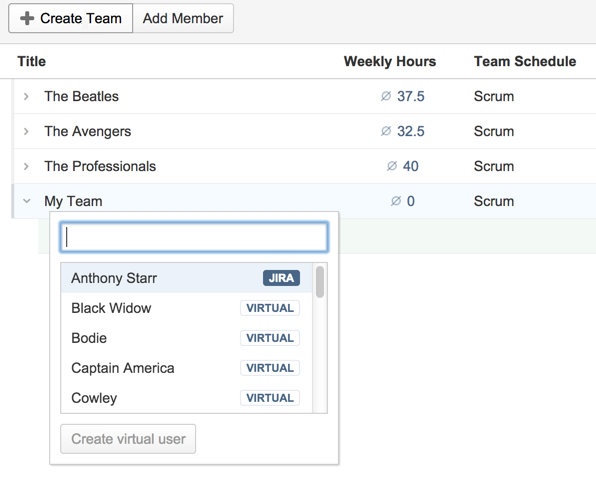 Select the user that is represented in your JIRA instance. For virtual users, type the name for the user and select Create Virtual User.